When I started at The FAIR School a little over four years ago communication internally and externally was a mess. Messages were not getting to staff, announcements over the loud speaker were made almost every half an hour, and emails clogged up each person’s Inbox. Instead of being productive, we were unproductive as a staff. Furthermore, on the community side we were not doing a good job communicating with our parents and families about upcoming events, conferences, and general announcements. What we quickly realized as a leadership team was that we were communicating in an outdated and ineffective manner. Papers were not making it home, a printed calendar changed weekly as new events were added and old ones moved, and there was an insane amount of time wasted looking through all staff email announcements that did not apply to everyone on the staff. Email: We do still use this form of communication between parent/guardians and staff to share specific concerns, get in touch with one another, or receive information. Sometimes also we use this as a school and parent/guardian message when we want to target a certain segment of our population, like only 3rd grade families. School Connects: Occasionally we use this system to “robo call” all our families. This is an important piece of our communication system in case of emergency, snow day, or other major announcement that needs to get to everyone at once. However, this system is used sparingly because our other methods are more effective. FAIR Talk: This is our monthly school newsletter. We still love the written word and greatly appreciate the newsletter form as a way to summarize and update families about upcoming events. Before we printed out a copy of this for each of our families, but now we do not print any. Instead, this is posted on our website and Facebook page for students, parent/guardians, and our community to digitally access and read. Furthermore, by publishing this digitally our communications director has the ability to use more pictures and lots of color in her design. SchoolView: This is our parent/guardian link to online attendance, grades, and registration information. We have had this method of communication in place for a number of years and it works well for its multiple intended purposes. Up to this point I think many of our communication methods are what you would see in many schools. We might use a tool slightly different, but most are similar. However, I think the next three methods of communication set The FAIR School apart. Text Message: Almost everyone has a cell phone, so why not communicate with our parents where they are instead of having them listen to a message left on their home machine (provided that they have a home phone) or wait for their student to come home from school? The request to have text messages actually came out of parent communication with the school. Our principal came to me with the idea and within a few weeks we had the system up and running with parents enrolled. We use texting to communicate up to the minute information and some of those typical types of announcements that we would normally have sent out through School Connects. Furthermore, we can tier the messages so that only Kindergarten parent/guardians receive it or all our 9-12 parent/guardians. The key here is that we are limited to 160 characters so you have to be short when communicating. As a staff we rolled this out two years ago and reminded them about upcoming summer trainings. They loved it because they did not have to continually check their school email during the summer and we loved it because they actually showed up for trainings. We also have a short code, so at events if people want more information we can have then text “FAIR” to our number and then send them back a URL, name of a contact person, or what ever our message happens to be. Website: The FAIR School website is not like other websites. Take a look at the main page linked here. What do you notice? There is a little text, links on the side, some photos, and videos throughout. Yes, we have really tried to bring the idea that a website is not a one dimensional space. We want it to be interactive, exciting, and engaging, albeit a bit untraditional. Furthermore, this is the main page for both campuses. 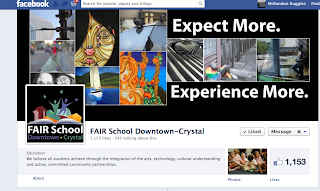 The FAIR School is one school with two campuses - FAIR School Downtown (located in Minneapolis, MN) and FAIR School Crystal (located in Crystal, MN). By looking at the site you will notice that a lot of the information is the same for both campuses, because it should be. This is big part of our communications mission where we want to have everything streamlined through one site in order for our community to come and grab what they need. One important distinction about our website though – it is only for our permanent information. That is correct, we do not post up to the minute, hour, or even weekly information on there. After the school year is set and the appropriate information has been updated, our communications director leaves this site alone. Instead, she focuses on another medium coming up next. We really want the website to be a place where parents and families can go to access contact information, forms, letters, lists, documents, and other information that they may need throughout the school year. 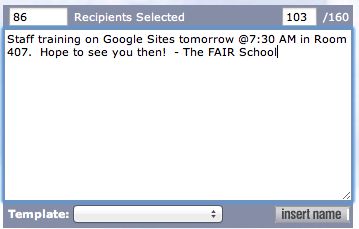 Finally, this entire site (and all of our websites at The FAIR School) are run by Google Sites. We pay almost nothing for overhead, nothing for updated software, and had very little training at the beginning. Our communications director has done a wonderful job creating templates, working through the small nuances of Sites, and really figuring out how to make it beautiful. First, all of our students have a signed parent/guardian visual media access. This allows us to take their picture and post it online. We have found that on the whole there are close to ten students in our entire school whose pictures cannot be posted out of over to 1200 students. Third, http://www.facebook.com is not a blocked domain at The FAIR School. We take the approach of teaching students about digital literacy rather than blocking websites. This leads to many courageous conversations in class about the appropriate time and place, but we have found that if the parameters are in place it works out well. Therefore, you will see students online, accessing the Facebook page throughout the day and checking for upcoming events. We have in fact even made it a practice to start many of our elementary school days by brining up the Facebook page during “Morning Meetings” to show photos and discuss upcoming events at the school. Fourth, this method of communication has been immensely successful. With the new timeline feature in Facebook we can track how often our page has been hit, shared, commented on, etc. With some of our posts last year we were reaching almost 600,000 people. I honestly do not know of a more effective, free, way to communicate with parent/guardians in today’s world. Facebook - For Staff: We have also begun to streamline our staff communication through a staff page on Facebook. This one page has more requirements and you have to be accepted to the group in order to view the information or post out things. However, this has dramatically changed how we communicate internally. It has cut down on emails among staff members, virtually eliminated all staff emails, and it has produced a more effective and productive work environment. Before you had to click on, open, and read every single mail message. Now, if it does not apply to you then scroll right on past. We can also be more creative with our posts - sharing links, videos, how-to information, and general announcements. It is cleaner, simpler, and once again it makes sense within today’s world. Plus, this site has become a great resource for our staff. We all constantly learn about upcoming opportunities, trainings, and events and now instead of keeping them to ourselves or writing an all staff email we share it with the community. Today when you walk through the floors you will see staff members often with Facebook open on one tab and their work Gmail account open on the other. Using Facebook as a staff has created a shift, but one that continues to happen. We still have to educate staff on where to post and access information, but with any addition or change there is going to be a wide range of adoption. As you hopefully get an idea, community communication is a little different at The FAIR School. We firmly believe that with these methods and by training our staff, students, parent/guardians, and our community where and how to find information we have become more successful across the board. Parents are “In the Know” and when they know what is going on it allows them to be more engaged in the school. For more information about communication at The FAIR School check out that page on our website. You may have also seen us in mentioned a recent article on Edudemic about schools using Facebook. Also, there is a whole lot more to this story of communication. If it would be helpful to ask questions, hear more about what we did, see examples or talk to someone, please let me know. I would be happy to connect you with the right person. I would ask each of you reading this post to consider how your school, business, workplace, etc. connects with its community? Is it effective? Why or why not? Is is instant? Are you meeting the needs of your parent/guardians, employees, stakeholders, or targeted audience? How can you change your communication to make it more effective in today’s world? Finally, at The FAIR School we do not have it all figured out. This has been a process to get to this point and one that has come with technical glitches, problems, and at the same time a lot of success. We are constantly thinking about and reframing what we do. If you have comments or suggestions, please leave them below.